Read our review below about a product called Organys Lash & Brow Boosting Serum, a serum that is formulated with peptides and botanical extracts designed to enhance your eyelashes and eyebrows. It is suited to frail, short or sparse eyelashes, thin or over-plucked eyebrows. Nettle Root has nourishing, healthy fats that can strengthen your hair from the roots, which makes it ideal for eyelash and eyebrow growth. Saw palmetto works by blocking the conversion to DHT, which helps decrease hair loss. Peptides boost your eyelashes and brows making them thicker and fuller. The Recommended use is once or twice a day for at least 60 days. To use, apply on clean face. Dry the applicator on the bottle edge. Dip the brush into the serum just enough to pick a drop. Flip the brush upside down for a second for the drop to soak into the brush and not to stay on its tip. Apply along the upper & lower eyelid at the base of all eyelashes. Blot the extra serum not to leak into the eyes. In the event of direct contact with eyes, rinse with water and seek medical attention if irritation persists. Make a consultation with your healthcare provider before use if you are pregnant or nursing, or being treated for any eye related disorder or actively undergoing cancer treatment. The product is sold for $35.00 from the manufacturer’s website. Surprisingly, the cost is about half of the manufacturer’s price at Amazon. You only pay $19.98 for it. Other online retailers charge around $23.00 per bottle. Considering that you will be applying the product twice a day, and over the period of two months for you to see results, you would need to buy two bottles, which doubles the price. Unfortunately, there is no money-back guarantee for this product. You may only return it within 30 days if you have not used it and is still in its original packaging. This is concerning considering that you would have bought two bottles to use over 60 days. You would end up losing a lot of money if you buy Organys Lash & Brow Boosting Serum and does not work. 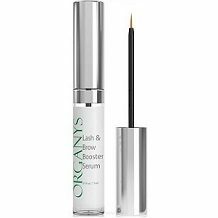 Organys Lash & Brow Boosting Serum might be effective for growing your eyebrows and lashes. All the ingredients in it are natural. The price is not bad when purchasing from third-party retailers. However, it is expensive on the manufacturer’s website. Furthermore, it might take you a full two months for you to see the results, which is very long. Moreover, considering the size of the bottle, and that you need to use the product for two months for you to see results, you would need to buy two bottles, which is very expensive. Another concern is that it does not have a money-back guarantee, and there is a possibility that it might irritate your eyes. When this happens you must discontinue the product immediately, and not even wait for 60 days to see results. Due to these reasons, we do not believe in this product.